This cheerful little family guidebook for Toronto offers parents—and especially kids—68 ways to enjoy Canada's largest city from the second largest collection of Sherlock Holmes memorabilia in the world and haunted walks around Chinatown to the legendary mummies and dinosaurs. Postcard-size and child-friendly, the book fits snugly in little hands or a parent's purse or pocket. Around Toronto with Kids offers kid-tested attractions, family-friendly eateries within walking distance, tips for parents and fun facts for kids. For a sample page, click here. Where in Toronto can you make your hair stand on end, literally, and also ring bells from an Asian temple? (No, not at the same time.) Answers are in three new Fodor's guides--for London, Paris and Toronto... it’s clear the writers understand a thing or two about parents. 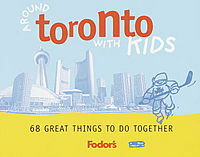 Reach out for Fodor's Around Toronto with Kids... Kate Pocock has come up with a dandy list to produce the short but information-packed little book. Residents and visitors alike will find unexpected treasures in Fodor's Around Toronto with Kids... A must pack. Picked as a Hot Holiday Gift for traveling girls in 2003 by the award-winning ezine, www.journeywoman.com. Buy Around Toronto with Kids at Amazon.com for just $11 US or at Amazon.ca for just $15 Canadian. For this first family book from the National Geographic Society, Kate coordinated the Canadian section and wrote 14 chapters. Her adventures ranged from hunting for gold in Canada’s Yukon territory to sleeping in a tipi on the prairies in Saskatchewan or blasting off from Space Camp Canada near Montreal. For a sample page, click here. A resource for making the most of your family vacations by turning them into opportunities for limitless fun and learning... a wide variety of hands-on, interactive adventures. Buy Guide to Family Adventure Vacations at Amazon.com.